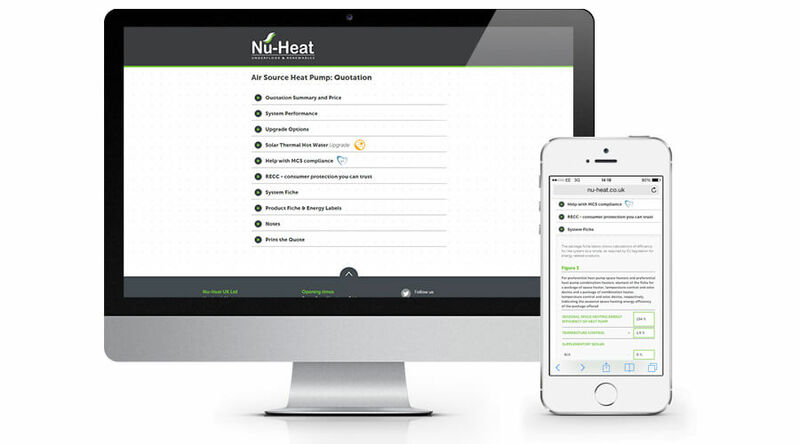 As soon as you send Nu-Heat a set of project plans and we have taken all of the relevant information required, work begins on your bespoke quote. Within 72 hours you’ll receive an email which includes a link to view the quote online. The online quote contains a lot of useful and specific information about the system we have specified, and because it’s hosted online it is quick and easy to amend so is always up to date. The price you see covers the complete design and supply of the system, including all components. This is a summary of everything we have included in your quote. 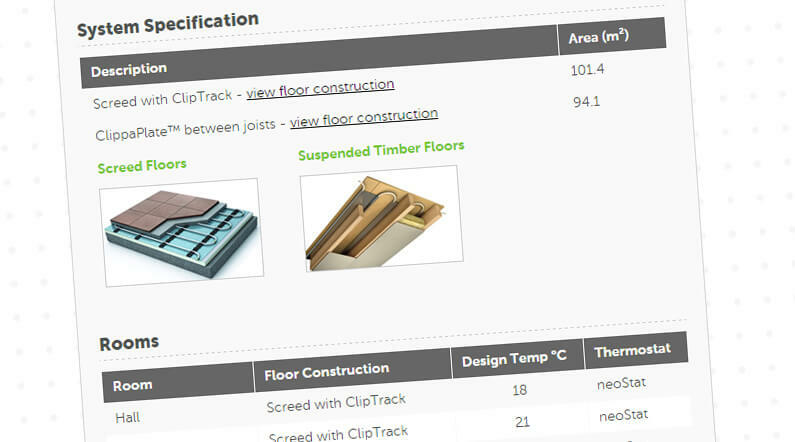 You will see the recommended solution we are quoting under ‘system specification’ with the option to view more detailed and technical information. This section also includes the price. Our quoted price will not change, so what you see here is what you will pay unless the project scope alters and we have to make significant revisions. Contact details for your Account Manager are clearly displayed should you have any questions or wish to proceed to the next step. This includes a breakdown of all of the rooms in the project that require UFH, their design temperature, the system specified, and whether they require a thermostat. This is useful as it allows you to check that every room you are expecting to be part of the UFH design has been covered. It also states the number of manifolds being used for the system and in which rooms these will be located. If anything needs changing at this point, or you have questions, simply contact your Account Manager who can help. A detailed breakdown of all of the components included in your UFH quote, from the manifolds right down to the tube staples. This can be a useful checklist further down the line, when you receive your delivery, to double-check quantities before installation. Every Nu-Heat UFH system comes with a dial thermostat as standard. This section covers popular system upgrades, such as smart or wireless thermostat options, along with the cost of upgrading. This is a summary of everything we have included in your quote. It gives details on the heat pump model we are quoting along with some benefits of the particular unit, whether air source or ground source, with the option to read a data sheet for more detailed product information. You will also see a breakdown of exactly what is included as part of the heat pump system (ground loops, the heat pump unit and other components) and an energy rating for the system we have put together, also known as an ErP rating. It’s likely that the system will qualify for the Government’s Renewable Heat Incentive Scheme and you will see that some information is included in the summary on the potential paybacks for your chosen system. The price we have quoted is fixed unless the project should significantly change and your Account Manager’s contact details are included should you have any questions or want to progress to the next step. This is where we get a little more technical! Expert system design is essential to creating an efficient heat pump solution. Every heat pump we design and supply must provide 100% of the property’s heat load for at least 99% of the year. In this tab we set out the Seasonal Coefficient of Performance for your heat pump system so that you can see how it will perform year-round based on local regional weather data. It also includes the total building heat requirement, based on information you provided pre-quote, together with the heat pump’s output for heating and hot water together with the ‘free energy’ you can expect the heat pump to produce. In order to receive the Renewable Heat Incentive payments the heat pump must be installed to strict MCS guidelines. We have a number of installer support options to help with this, whether the system is being installed by an MCS or non-MCS registered installer. Your Account Manager will be able to talk through the best option for the project. Getting a bespoke quote is quick and simple – just send us a copy of your project plans. If you are renovating and do not have drawn plans, that’s ok, you can draw the rooms and provide us with measurements to work from. Plans can be sent via email to info@nu-heat.co.uk or through our website. You can also speak with one of the team beforehand if you have any questions about how UFH or a heat pump can work in your project by calling 01404 540650.